This trip through the virgin forest is very interesting and thanks to all the trees and the dense canopy comfortable and not too hot. On this trip you can still admire the giant trees, which are used by different climbing plants to get to the light. Due to the dense network of branches and leaves the sun has hardly any chance to reach the floor with its rays. The deeper you get into the rain forest, the more untouched and intact nature will be. The river Baqueano you will reach after a two and a half hour foot trip on small paths. After the arduous walk the wonderfully cooling and clear water of the Baqueano is waiting for you. 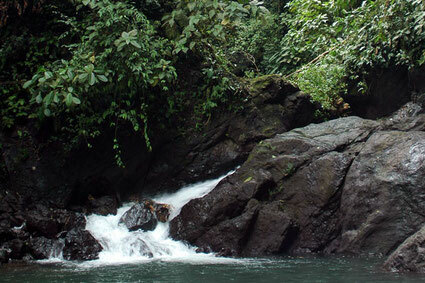 We will have lunch at the border to the national park «Corcovado». In the afternoon another path will take you back to the Tamandu-Lodge.